MONTREAL—The Toronto FC juggernaut keeps rolling. 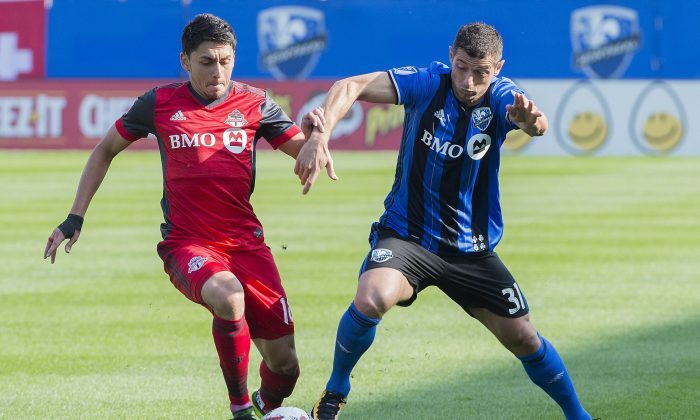 The high-flying Montreal Impact and its four-game winning streak came to an abrupt end on Sunday, Aug. 27 at Stade Saputo as TFC triumphed 3–1 in front of a sell-out crowd of 20,801. With the win, Toronto FC is on pace for 70 points, which would top the league’s best record previously set by the 1998 L.A. Galaxy by two points. The away win in Montreal was a huge feather in the cap for a team that is garnering serious consideration as potentially the best ever in Major League Soccer. Toronto FC is attempting to become the first team to win the Supporters’ Shield for best regular season record and MLS Cup in the same year since the 2011 L.A. Galaxy—a team many pundits consider the greatest in MLS history. That team had David Beckham, Landon Donovan, and Robbie Keane. 2017 TFC has Sebastian Giovinco, Jozy Altidore, and Michael Bradley. No MLS team in the past two years has had a winning record on the road. TFC is the only team in the league to have one this season—and it’s three games over .500. The Reds are now unbeaten in their last nine games and are nine points clear of New York City FC atop MLS. “The accomplishment that I’m most proud of is where our group is in terms of the locker room, their attention to wanting to get better,” said Toronto FC head coach Greg Vanney. TFC captain Bradley isn’t surprised with his team’s success. Giovinco scored two beautiful goals and Altidore notched the game-winner early in the second half. Ignacio Piatti scored the Impact’s lone goal, but those celebrations were very short-lived. Giovinco gave TFC a 1–0 lead in the 41st minute with another of his trademark free kicks—his 14th goal of the season. The “Atomic Ant” celebrated with a crybaby gesture toward the Impact supporters but said after the game he doesn’t pay attention to what Impact fans say about him. His second goal came less than a minute after Piatti had given Montreal a shred of hope in extra time. I think we’ve got a good team to match up with a lot of teams. Impact captain Patrice Bernier said his side didn’t play its best game, but gave TFC credit for their win. “They’re efficient, they’re good at what they do but we know we’re able to put some pressure on them,” he said. TFC doubled its lead in the 52nd minute when Marky Delgado got free down the right flank and found a wide open Altidore. The U.S. international simply had to tap the ball past a helpless Evan Bush. Early on, it was an even battle in terms of chances and tactics with plenty of individual contests to satisfy the football connoisseur. But TFC started to dominate possession as the first half wore on and the Impact were unable to respond. The buildup to the first Impact–TFC match of the MLS regular season had a decidedly playoffs feel to it. Montreal, having just crossed the red line into the playoff positions last weekend found itself on the outside looking in thanks to the Saturday, Aug. 26 results. Last year’s Eastern Conference final, which TFC won 7–5 in extra time was a phenomenal battle between the two Canadian rivals. That was followed up by another close Reds win in the Canadian Championship final in June. Many say these derbies between Toronto and Montreal now make it the best rivalry in MLS. The rivalry may arguably be the best among two Canadian pro sports teams. The Impact and TFC meet two more times before the end of the regular season in Toronto on Sept. 20 and Oct. 15. The Reds have a bye during the FIFA international break, so their assault on the MLS record books won’t continue until Sept. 9 when they host San Jose. “The byes never really come at a good time,” Vanney said. With the momentum and desire to win that TFC has right now, two weeks will feel like an eternity.